Please allow 2 to 3 business days to build & ship your order. The RetraxPRO MX retractable truck bed cover is part of our Premium Aluminum Series covers. The Premium Aluminum Series covers are constructed from industrial strength aluminum slats that provide unsurpassed strength and ruggedness. The RetraxPRO MX combines industrial strength aluminum construction with an incredibly resilient matte finish. The matte finish on the RetraxPRO MX provides incredible scratch resistance and adds style to your truck. The RetraxPRO MX not only provides rugged protection for your truck bed it also provides a patented low-profile design that enhances the appearance of your truck. The compact storage container features a unique spiral track system that prevents the cover from coming into contact with itself as it opens and closes. The operation of this cover allows it to always stay flush to the rails and creates a dependable seal to help keep the elements out and protect your cargo. The RetraxPRO MX has a sealed ball-bearing roller system that glides effortlessly along the rail with a convenient handle that eliminates the need for pull straps, Velcro, snaps or springs. The RetraxPRO MX is key lockable in any position that gives you unlimited flexibility in your hauling capacity. If you wish to learn more about the RetraxPRO MX visit our FAQ page. Have a Truck ToolBox? No Problem, please fill out this form or please call customer service. Looking for above the cover management system? Check out our Trax Rail system. MX covers are given a rugged and durable matte powdercoat finish for both style and dependability. Constructed from heavy-duty aluminum slats that are engineered to retract without trapping dust, wear out or freeze. 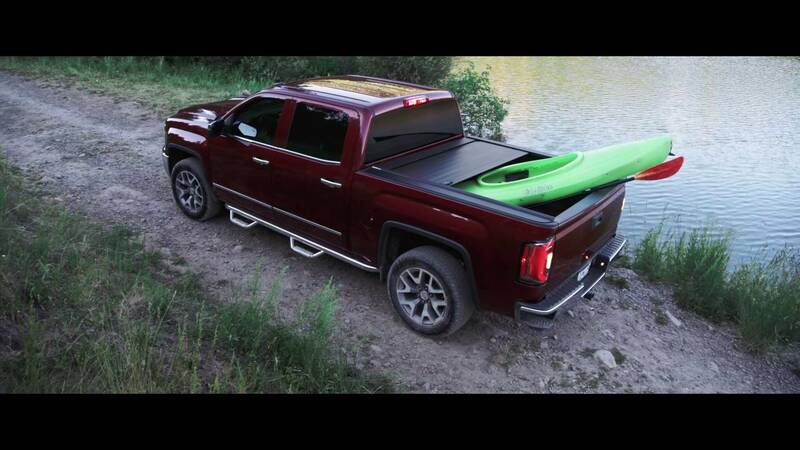 The patented low-profile design incorporates a front cover that is flush with the truck bed cover, which streamlines the overall appearance and provides a firm, dependable seal to help to keep the truck bed dry. The clamp-on bed cover can be installed by anyone with basic hand tools. No two trucks are exactly alike so our mounting system is adjustable for a perfect, no hassle fit every time. Sealed ball-bearing rollers mounted onto the aluminum support beams allow the RetraxPRO MX truck bed cover to retract or close effortlessly without the use of springs or any kind of mechanism – no moving parts to jam, freeze or fail. Please feel free to make use of the RetraxPRO MX Truck Bed Cover installation instructions below to assist you with the installation. Upon purchase you’ll receive vehicle specific instructions. However, if you have further questions or need technical assistance please call one of our knowledgeable installation experts at 1-800-206-4070 or send us a message and we will be happy to assist you. The RetraxPRO MX has a Legendary Lifetime Guarantee. This warranty is to the original owner and is non-transferable. Retrax makes every effort to assure that its products meet high quality and durability standards to the original retail consumer/purchaser of our products that each product be free from defects in materials and workmanship. Constructed from heavy-duty aluminum slats that are engineered to retract without joints or hinges that can trap dust, wear out or freeze. The cover can be locked open in any position along the rail to allow unlimited hauling flexibility and convenient use with a fifth-wheel trailer. © 2019 Retrax. All Rights Reserved.